Summertime is bathing time. However "brain-eating" amoeba and "carnivorous" vibrios spoil the pleasure for holiday makers. Doctors are effectively groping about in the dark when dealing with non-specific symptoms, such as occur with amoebic encephalitis. This infection begins insidiously with a headache. “Killer bacteria spread fear and terror”; the media’s warning to a bathing-indulgent population. “In the Gulf of Mexico, carnivorous bacteria have been pushing people, both tourists and locals, into the sort of panic which would otherwise only be seen with shark attacks”. The cause of these headlines is the microorganism vibrio. 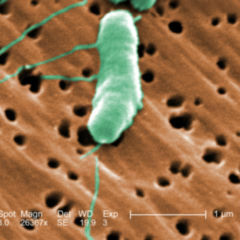 The most famous representative of the genus, Vibrio cholerae, triggers cholera. 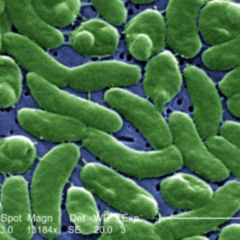 Vibrio vulnificus is currently raising mischief in the Gulf of Mexico. Last year, the Baltic Sea was also affected. If Vibrio vulnificus penetrates our bodies, necrotising fasciitis can occur. This life-threatening infection affects subcutaneous tissue and fascia. Particularly at risk are patients with circulatory system problems, such as those resulting from diabetes or “smoker’s leg”. Patients with immunosuppression or immunodeficiency also have to reckon with high risk. If a patient’s medical records show a recent medical intervention in the gastrointestinal tract, infections via this path are also possible. Bacteria invade wounds and cause fulminant infection. The infected tissue must be surgically removed as quickly as possible. Should physicians recognise Vibrio vulnificus early enough, there is a definite chance to intervene using medications. Among medications seen as suitable are tetracycline plus third generation cephalosporins, and fluoroquinolones. This is easier said than done: at first, rather unspecific symptoms appear, such as fever or pain. Despite the latest reports, there is no reason for panic, as figures from the Florida Department of Health show. In 2012, 26 people were affected, and there were nine deaths. After an increase in 2013 (41 affected, twelve deaths) in 2014 the figures went slightly downward (32 diseases, seven deaths). With respect to 2015, the health department indicates 45 affected and 14 deaths. Since no notification requirement for V. vulnificus infections exists, at the Center for Disease Control and Prevention (CDC) there exists only fragmentary data. Experts indicate an estimated 80,000 affected and 100 deaths per year in the USA. They advise at-risk patients not to go swimming with open wounds nor to eat any raw seafood. As a comparison: every year millions of Americans bathe in the sea, and 3,500 people drown. There is further bad news out of the USA. After a 18-year-old student died from the consequences of a case of meniningitis, CDC experts began a root cause analysis. Previously, the student had visited a whitewater park in North Carolina. 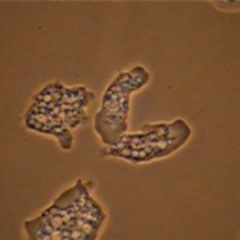 Pathologists found Naegleria fowleri in the brain of the deceased victim, which resulted in the diagnosis of primary amoebic meningoencephalitis (PAM). This protozoan has low infectivity. It occurs in shallow freshwater lakes in America, Australia and the South of France. Doctors know of two dominant routes of infection: should N. fowleri manage to find its way into the eyes, sclerosing keratitis, an inflammation of the cornea, is the result. If the bather breathes contaminated water, the unicellular creature passes along the olfactory nerve into the brain and triggers PAM. Particular difficulty also comes with the non-specific symptoms. After an average of five days, patients complain of headache, fever, nausea or vomiting. Neck stiffness, altered consciousness, dizziness or unconsciousness occur later. Many people end up dying five days after they first complained of discomfort. The high mortality rate – according to CDC there have from 1963 to 2016 been exactly 138 infections, with only three survivors – has a number of causes. In endemic areas scientists have found specific antibody titers in many people’s blood. Many contact events with N. fowleri probably do not lead to the dreaded illness, so that only severe progressive forms are documented. Moreover primary amoebic meningoencephalitis belongs to the group of rare diseases about which doctors, when confronted with non-specific symptoms, hardly think about. In the US, when developing a medical history they ask about rare leisure activities just prior to the illness. If detected early, there is at least the chance to intervene. The Food and Drug Administration (FDA) named amphotericin B as the systemic agent of choice. The molecule however only penetrates the blood-brain barrier very poorly. Doctors therefore employ the active ingredient intrathecally. In the instance of eye infections, among other medications ketoconazole. miconazole. pentamidine and propamidine are available for use. In order to protect themselves, CDC experts provide bathers with some relatively mundane tips. When swimming, nose clips prevent contaminated water from being inhaled. And anybody who does not have tap water at hand should refrain from doing nasal irrigation, the authority add.